At Hilliard City Schools, personalizing education and meeting individual needs for students is part of making sure our children are ready for tomorrow. Ridgewood Elementary School, as with all elementary schools in the district, has a resource room with intervention specialists and aides to help get or keep students on track. The resource room is a place for students to go if they are behind or struggling. It is where direct, specialized instruction can be given, for a period of time, away from the traditional classroom setting. 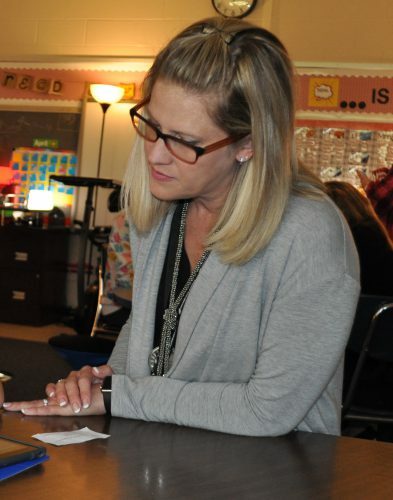 Shannon Aslanis, in her second year at Ridgewood but in her 15th as an educator, is an instructional aide who works alongside Kristina Bope with children who are in grades 3-5. There is also a team that works with grades K-2. While many parents and grandparents of children currently attending school grew up sitting in rows of desks being taught by a teacher standing in front of the class, there are many different ways for students to learn and Hilliard City Schools is working to find those ways. Ridgewood students have the opportunity to get more individualized attention when needed – sometimes in the form of work in small groups but also one-on-one when needed – before returning to their regular classrooms. Reading is an essential skill that can affect a student’s performance in all subject areas, and in today’s classrooms, teachers are utilizing technology to keep students motivated, as well as engaged in what they are learning. It also has the ability to turn reluctant readers into passionate readers. For younger readers at Ridgewood Elementary School, having iPads, as well as a SMART Board, can make a huge difference in visualizing and comprehending words. She uses the iBooks app on the iPad to give her students a hands-on experience. Bringing the classroom’s SMART Board into play, Dunworth can help students sound out words and make reading even more visual. She gathers the class together in front of the board and breaks down the sound of words as well as what the object a word describes looks like. Beginning in the 2017-18 school year, Hilliard Schools became One2One for every student K-12, throughout the district. This means every student has an iPad. Younger students have gravitated to the technology and become creators. Teachers are able to use iPads, and the apps available to them, to break down barriers in a visual way. Dunworth’s work with the iPad has allowed her students to be more interactive with learning to read, as well as other subjects. Working at Ridgewood is special to Dunworth. She has taught at the school for seven years, in special education, kindergarten and first grade classrooms. Ridgewood Elementary students are helping animals in their neighborhood and gaining valuable life skills at the same time. It all began with Global Read Aloud Day, where teacher Andrew Eder read the book A Boy Called Bat to his second-grade students. The school invited a naturalist from Hilliard and an employee at the Columbus Zoo came to talk to the students. There’s a educational term for what the students are doing – project based learning. It’s when students start with a complex question and use critical thinking, teamwork and self-management to solve a problem. The birdfeeders have been constructed and will be placed just outside Eder’s classroom, where they will be observed. Modifications will be made as as needed as the students form conclusions in their pursuit to help these animals. The birdfeeder project has proven to be another example of what makes Ridgewood a great school community. “What I love about the Ridgewood community is the people are very tight knit,” said Eder. “What’s unique about Ridgewood is people are passionate about Ridgewood. People are passionate about Hilliard. In Hilliard City Schools, we have a passion for growth. That means we are exploring ways to engage students creatively so they can be inspired through learning a new skill. Physical education teacher Gordon Fowler embodies the “growth mindset” by using a portion of his curriculum to teach the sport of archery. After Fowler took part in training and a certification process, he began teaching the sport, as well as offering an after school archery club for fifth graders. The program being taught during the school day is partially funded through a grant. Archery also serves as a way to benefit the whole child. Math skills are further developed when tallying scores and technology can be used when utilizing iPad apps that serve as a scoring system. Fowler sees archery growing in popularity because of its emphasis on learning to have focus, self-control, discipline, patience. The program has been very successful at Ridgewood and has benefited students in multiple ways. It’s provided many lessons required to be successful in the classroom and in life. Dublin City Schools and Hilliard City Schools will be partnering together to host “Be Well: A Parent University Event by Dublin and Hilliard City Schools” on Saturday, March 9th from 9 a.m. – 3 p.m. The event will feature several free informational sessions for community members focused on student and family well-being.